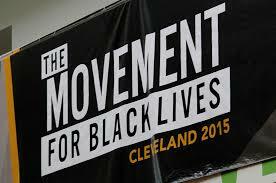 Cleveland — From July 24 to July 26, over 1,500 registered Black activists and organizers from all over the U.S., Canada and even the Caribbean converged in Cleveland for the 2015 Movement for Black Lives National Convening. In addition to police terror and state violence, pertinent issues such as mass incarceration, economic empowerment, education, housing and Black health were all centered at the table of Black consciousness. The Movement for Black Lives Convening was more than just an assembly of passionate activists and talented organizers flexing intellect. It was way more than just workshops and Black radical thought. This here was a weekend of love, a sacred and safe space for Blackness that isn’t typically created, particularly on a national level. For three days, we could actually breathe. We could touch each other, learn from and connect with one another. We actually could talk in private amongst ourselves. We could love our lips, noses and hair without stares from others who simply cannot relate. We could collectively celebrate our ability to survive, in peace, in whatever form we chose to do so. We could talk to each other without some white person interjecting their personal privilege and lack of understanding. We laughed together. We cried together and cheered for one another. We challenged each other and shared experiences. We shared resources, studied together and created new networks. We debated. We danced. We chanted. We partied together. We healed. Everything U.S. America refuses to allow us to do on a regular basis, we did for three whole days. We embraced the full essence of ourselves as living beings — our own culture, our own heritage, our own ancestors — our history, our roots and the many forms in which Blackness is uniquely packaged. For three whole days, ALL BLACK LIVES stood together, regardless of one’s religion or sexual preference, regardless of one’s age, gender or political affiliation. This convening was truly for everyone: Black women, Black men, Black youth, Black elders, Black straight, Black queer, Black trans, Black labor, Black clergy, Black Muslim, Black Christian. It was “All Black Everything.” And I promise, I’m not making this up. You would just have had to have been there to fully understand. If it weren’t for the physical walls of Cleveland State University, you probably would have thought you were back in old Congo Square. Our daily course of meetings, actions and workshops was all well planned, with allotted time and periodic breaks for flexibility. Access to several ballrooms, the student center, media center and main classrooms provided plenty of space for the approximately 1,500 attendees. Workshops of one-and-a-half-hour blocks were loose but intense, free-flowing but focused. I was thoroughly impressed with the wide range of topics and dialogue that helped to create a holistic and inclusive approach to the overall convening. There were discussions on Black culture, Black art and the Black aesthetic — workshops specifically addressing “The Miseducation of Hip Hop,” “Theatrical Jazz” and revolutionary poetry. Dr. Treva Lindsey led a workshop on “Black Scholar Activism.” Black Lives Matter co-founder Alicia Garza led a session on “Conflict Resolution” within the movement. There were discussions on revolutionary parenting and reproductive justice, social media and technology, farming and land reform, classism and labor, feminism and internationalism — gender, sexuality and Black health. There were two workshops on AIDS and HIV — which is a tough talk, yes, but a very pertinent matter in reference to the survival of Black lives. There were live yoga workshops and meditation spaces all three days. Of all the many spaces of beautiful Black thought, my favorite workshop of the entire weekend was entitled, “Cointelpro 101 & U.S. Political Prisoners.” I made sure to get there early so I could get a good seat. I didn’t know who was going to be there, but I was aware that this particular workshop was going to be facilitated by Ashanti Alston, co-chair of the National Jericho Movement, Black Anarchist and former member of the Black Panther Party for Self Defense. I was definitely not going to miss this class. Two steps into the room I see Ramona Africa, MOVE member and one of my all-time favorite freedom fighters. I shook her hand, thanked her and paid homage. I looked over slightly and sitting beside Ramona was Eddie Conway, a 44-year-long U.S. political prisoner and former member of the Black Panther Party. Once I paid respect to Brother Conway and found a seat, I looked up to the panel’s far left, and there was Henry “Hank” Jones and Pam Hannah — former members of the Student Nonviolent Coordinating Committee, the Black Panther Party and the San Francisco 8. As a diligent student of Black Liberation, I was completely blown away. It was truly humbling just to be in the room — just to breathe the same air was an honor to me. Here I was … here WE were, sitting at the feet of giants, a new generation taking notes from the old field generals. As they discussed the specific details of their individual cases of state surveillance and repression, over 100 young organizers packed the room. We squeezed in until there was no place sit down, not even on the floor. Sisters and brothers raised the banner of Mumia Abu-Jamal, Herman Bell and Russell Maroon Shoatz. Panelists discussed the courage and many sacrifices of the Black Liberation Army and Revolutionary Action Movement. Young soldiers had a chance to connect with the old. It was an absolutely beautiful sight to see. Wow! For those who were not up for such heavy discussion, there was also a constant stream of documentary and film screenings. Journalist and Black cultural curator Dream Hampton hosted her new film, “Treasure: From Tragedy to Trans Justice.” Black filmmaker Renata Hill screened their widely acclaimed, “Out In The Night,” which has screened in over 90 venues since last year. Rounding the weekend was a full screening of the much anticipated new documentary, “The Black Panthers: Vanguard of the Revolution.” Needless to say, the weekend’s schedule of events was something quite special. Speaking of special, in a special tribute Friday evening, we were addressed as a mass assembly by several of the recent families who have lost loved ones to police brutality and state violence. As each family approached the podium, we cheered and loved them up through crowd support. It was eerie how we had seen them all on the news over the previous few years, proud, but slightly broken. Gwen Carr, mother of Eric Garner, was there. Martinez Sutton, brother of Rekia Boyd, also spoke. Tracy Martin, father of Trayvon Martin, spoke. Amberly Carter, cousin of Emmett Till, also brought words, and so did others. At one point, nearly all of us in the building were crying. It was very important that hashtags became human again. There were so many faces and names, some of them we had almost forgotten. Ironically, Cleveland was initially chosen as the host city to honor the lives of 12-year-old Tamir Rice and 37-year-old Tanisha Anderson, both local victims of police terror. It was so good to be reminded of just how strong these families really have been. This convening was also a moment of personal growth. I really appreciated the emphasis and inclusion of Black trans lives. I needed that and so did many others. For me, before Cleveland, the question of “Black Trans Lives” was a political matter. I supported trans lives, but merely as a point of theoretical principle. Before Cleveland, I honestly did not see their struggle as my own. Thankfully, it was here at the Black Lives Convening that the Black queer and trans question became one of a personal matter, with implications that are much more than just political. I realized that these beautiful lives are more than just comrades. They’re my kin folk, my cousins, my aunts, my BLOOD! We are more than just “politically” intertwined: we are one people, one resistance, one struggle to simply survive. Over the course of the weekend’s events, I not only stood with trans comrades, I really listened to them, with my spirit. And in listening, I began to identify with their quite simple, but burning quest for complete liberation — Black liberation, the same kind that I want. Lol … I even learned a new prefix, “cis,” which I couldn’t wait to use in a public write-up. This convening was truly one of the most impactful experiences I’ve ever lived with my own people. I honestly did not want to leave. Surprisingly, I was not the only organizer who expressed such sentiments. As a people, we had managed to create a new “home” right there on the campus of Cleveland State amongst ourselves. It was a feeling that really cannot be explained with human words. The Movement for Black Lives National Convening was framed as a space and time that would be used to “reflect on our histories of struggle, build a sense of fellowship that transcends geographical boundaries and begin to heal from the many traumas we face.” To those who were there, it was just as advertised. This convening was not only historic; it was right on time. We needed this as a people. We needed this as freedom fighters. We needed this as a movement. For those of us who have completely invested ourselves in this current movement for Black lives, we very often fight, but forget to feel. We feel, but very often fail to heal. Some of us are so busy moving around, mobilizing and organizing, we don’t even eat properly. We don’t sleep enough and take care ourselves. While I was in Baltimore for a month during the People’s Rebellion, I met organizers there from both Ferguson and New York who had slept in cars for over a week. All they had was food and gas money. All they had was their courage and dedication. I gave them what little cash I could spare and we traded contact information. For those on the outside looking in, please understand that some of us are giving all we have — some of us are giving our lives. That’s what last weekend was all about: Black struggle, one sacrifice, a renewed sense of dedication, clearly emanating from a bold and brilliant new generation. As Ramona Africa so poignantly stated in one of the workshops: “Don’t be afraid to be a revolutionary. 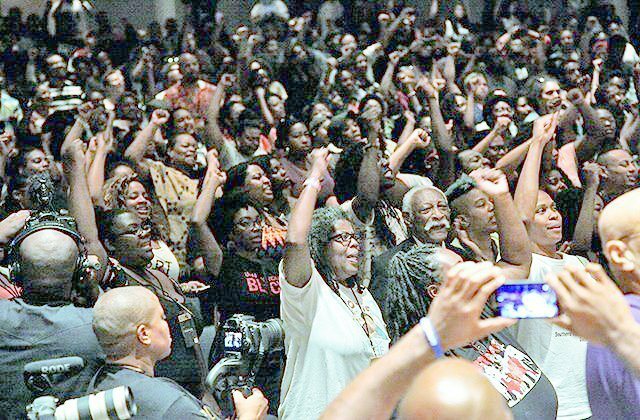 We have nothing to lose.” After last weekend’s Black Lives convening, thousands of us really believe that now. We believe that we can win. Photo: Cleveland BLM opening session.